About fifty people were seated around the nondescript, medium-sized room as I arrived, and the moderator Anh-Hoa Thi Nguyen, the poet, community artist, and editor of AS IS: A Collection of Visual and Literary Works by Vietnamese American Artists, finished introducing the other four panelists. Aimee Phan started off the presentations by reading from her novel-in-progress, a follow-up to her debut novel, The Reeducation of Cherry Truong,which weaves together intergenerational stories taking place in Vietnam, France, and the US. She read a scene in which a pianist wanting to conceive a child with her husband, a political prisoner, and a lab tech converse in a tense discussion. The Providence-based poet Stacey Tran read next, reading imagistic lyrics focusing on food and familial relations from her first full-length collection, Soap for the Dogs. The Portland-based, hybrid-media artist Dao Strom then read from her bilingual poetry/art book, You Will Always Be Someone From Somewhere Else, syncing her reading with the projection of black-and-white images from the book on a small screen mounted on the wall above the panelists. The images were informed by inherited war memories and recollections of childhood: a helicopter in the sky, waves in an inverted triangle. Strom noted that the book was partly an investigation of the psychological difficulties of leavings and returns, drawing upon her parents’ stories. Her mother was a refugee from Vietnam due to the war who was unable to return to Vietnam until recently due to personal and political factors, and her father grew up in Denmark during World War II and never returned there by choice. 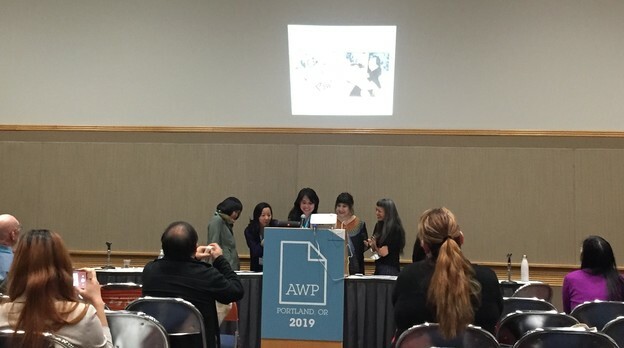 Due to technical difficulties, the panelists had to crowd around a single laptop at the podium where they cheerfully read a scene taking place in 1955, in a “South Vietnam that no longer exists” as Bui noted. The scene occurs during the end of the French occupation of South Vietnam and the mass exodus from the North to the South, when Bui’s father was fourteen years old, and each of the writers voiced the dialogue of several family members, as panels from the graphic memoir projected on the small screen above them. The presentation ended with an audio recording of Walter Cronkite narrating a documentary on the Vietnam War. Strom answered first by saying, “This was my question, which I asked because I wanted to know about the use of aesthetic form to disrupt and trouble the narrative. The Western narrative features one character, and I want to emphasize multiple voices in my work, which is something that we talk about in the She Who Has No Master(s) collective.” The group, which all the panelists belong to and which includes other authors, is a collective project that brings together voices of women writers of the Vietnamese diaspora with participants engaging in hybrid-literary collaboration, the sharing of personal stories and struggles, and occasional writing retreats. Tran added, “There’s a strong tradition of Vietnamese poetry and oral storytelling that I’m drawing upon, which is part of the reason I’m working with my family’s stories. It’s a gift to be able to share their stories, which are also mine.” Phan talked about getting the rhythm of her characters’ voices right as a formal concern of writing her fiction. All of the authors mentioned drawing upon familial stories in their writing, partly as a political act. The panel answered another question from a young APIA woman about translation and then passed the mic to a man in the front row who began by complaining that his book about the war in Vietnam wasn’t reviewed by diaCRITICS, and he was wondering why. Strom, the editor of the journal, noted that the publication is devoted to the arts and culture of the Vietnamese and Southeast Asian diaspora and that they try to publish works by underheard and overlooked voices. The man then asked if the panel had heard of John Balaban, the poet and translator who was involved in the attacks on Marilyn Chin’s translations of Ho Xuan Huong, an eighteenth-century Vietnamese poet, by the editor and the marketing and sales director at Copper Canyon Press in Poetry magazine’s letter to the editor section in 2008. At this point, several people in the audience gasped and grumbled. “We’ve heard of him,” said Strom. Nguyen noted that the preferred term is the war in Viet Nam and Southeast Asia and then said there was time for one more question. The panel concluded with a friendly discussion of each of the authors’ current projects. Several of them spoke about working across media and genres in order to be able to tell the stories that they needed to in modes that would accommodate the telling. I left the panel impressed by the lucidity, deftness, and generosity of all the panelists in writing and speaking about difficult histories — personal and public and their intersections — fraught with obfuscation and active attempts to erase and silence, which persisted into this very panel — underscoring the necessity for their creative, resourceful work. The bluster of the men who would usurp (obliviously or not) the serious and precise work of the authors was diffused by the intervention of the writers themselves and an audience that had seen this behavior too many times before. I also left the presentation thinking about how productive simply gathering together to talk to one another in a collective project like She Who Has No Master(s) is. The collective reminded me of attending women of color meetings in college, during which we complained and commiserated and talked about what and whom we liked and what we wanted to do and how to go about it. We worked out ideas and feelings. Several of those women are luminaries in the literary landscape now.